Heat oven to 375°F. Spray 13x9-inch baking dish with cooking spray. In medium bowl, cut butter into cookie mix using pastry blender or fork, until mixture is crumbly. Reserve 3/4 cup mixture for topping. Mix egg in remaining mixture until incorporated. Press crumbs evenly in bottom of dish. Bake 13 to 15 minutes or until light golden brown around the edges. Cool completely. In 15x10x1 inch pan, place the reserved topping crumbs in a thin layer. Bake 8 to 10 minutes, stirring occasionally or until light golden brown. Cool completely. Crumble into small pieces. Set aside. In 3-quart mixing bowl, beat cream cheese with electric mixer on medium speed, for 1 minute or until smooth. Add sweetened condensed milk. Beat until well blended. Beat in the whipped topping until smooth. Add the pudding mix and continue to beat for an additional 2 minutes or until everything is well combined. Spread 1/3 of the pudding mixture onto cooled base. Arrange bananas in a single layer over pudding, Top with remaining pudding mixture and refrigerate for 10 minutes or until set. Sprinkle the cookie crumbs over the pudding. To serve, cut into 24 squares, 4 rows by 6 rows, and serve individually. 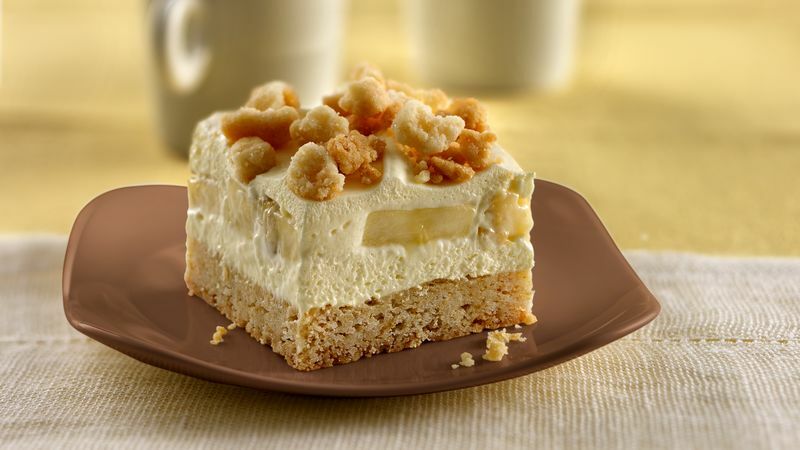 Consumer comments: Love, love, love banana pudding! What a great twist on an old-time favourite!